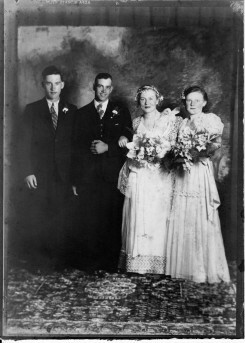 Gordon Conn, Carl Forester, Jean Conn Forster, and Freeda Conn, 1939. Freeda Conn worked for Naval Intelligence in Ottawa tracking ships and translating and sending messages to the Atlantic Ocean convoys by secret codes. Her parents were Lilian Greason and Joshua Conn of Lot 29 Concession 8. She had taught in West Nissouri before the war. She is buried in St. Marys Cemetery, St. Marys, Ontario, Canada.